In the South Valley of Albuquerque, New Mexico, a chaotic morning ritual familiar to many families plays out. “Luciano! Time to get up.” Bows in their hair, Milani, 6, and Jazalea, 3, are ready for the day ahead. They beckon their 10-year-old brother, Luciano, to hurry up and finish his scrambled eggs. Luciano’s school bus ride ends each morning at Los Padillas Elementary, part of Albuquerque Public Schools. The school, like the neighborhood where it is located, has struggled, and it is in the midst of the state’s Most Rigorous Intervention process, or MRI. In fact, Monique wasn’t sure what she was hearing when she first learned of the school; it sounded like mas — “more” in Spanish. 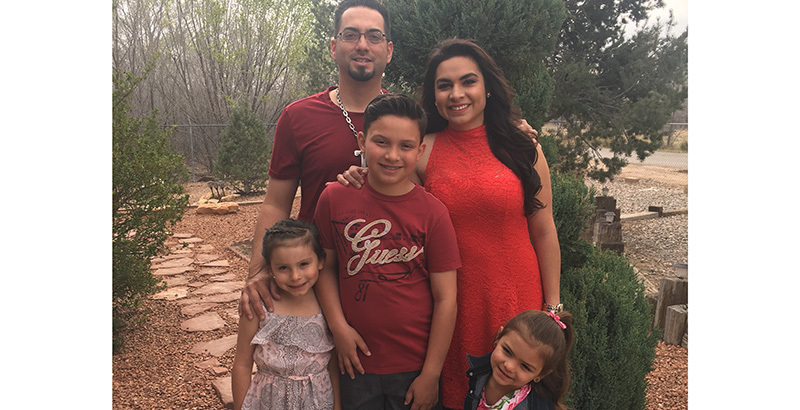 But MAS, Mission Achievement and Success, was recruiting students from Albuquerque’s South Valley, offering busing and a different approach to education. And that school with the funny name unlocked a newfound belief in what’s possible for the Giovine family themselves and their children. But through her chance discovery of MAS and sheer determination, the Giovine family discovered one of the best-kept secrets in the state. MAS was recently approved to open a second campus in Albuquerque, the first charter school ever give the green light to do so. The second campus aims to open in the fall, providing relief to hundreds of families who, according to MAS, are on the school’s waiting list. At a recent basketball game, Milani figured out the word “roadrunner” before Luciano, despite being four years younger. Milani rarely has her own homework; she helps her brother with his. At MAS, homework is rarely assigned because the school day is longer so more direct support can be provided each day. Seth Saavedra is an education blogger for EducationPost.org and a former middle school teacher. He was born and raised in New Mexico and lives in Albuquerque.